A French Louis XV style ormolu-mounted, Aventurine and Japanese lacquer Table à Écrire circa 1880 After a Model by BVRB circa 1880. 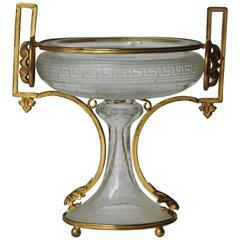 An very fine neoclassical engraved and ormolu-mounted crystal cup Designed with a Greek frieze circa 1870. - Marquetry wood - Gilt and chiseled bronze - 1880 period - Leather top - Three drawers. A lovely, elegant Louis XV style bronze-mounted mahogany lady's writing table, or side table, with one drawer, by Francois Linke. Bronzes stamped FL on the reverse.